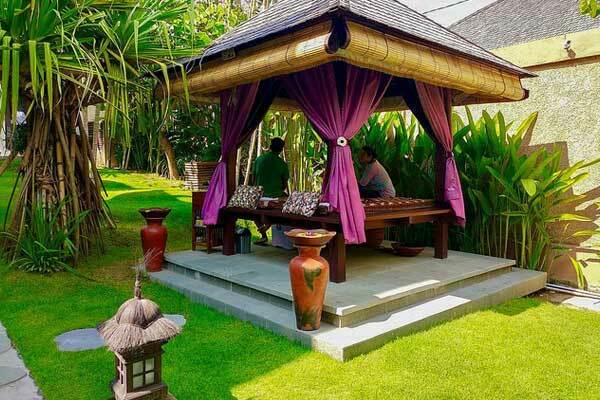 There are a lot of things to take into consideration when choosing a place to live in Bali. Most expats live either on the coast in the major tourist resorts of Kuta, Seminyak, Canggu or Sanur, or in the inland bohemian artistic hub of Ubud. So how do you choose between them? Or do you head off the beaten track and choose somewhere less touristy? Both coast or inland have their pros and cons. The scenery inland can be breathtaking with views of volcanoes and rice paddies and the sights and sounds of nature. But then there are the spectacular sunrises or sunsets over the ocean that are hard to beat. Peace and Quiet or Hustle and Bustle? Are you a social butterfly, into nightlife and like lots going on or do you prefer to chill out in the middle of nowhere? 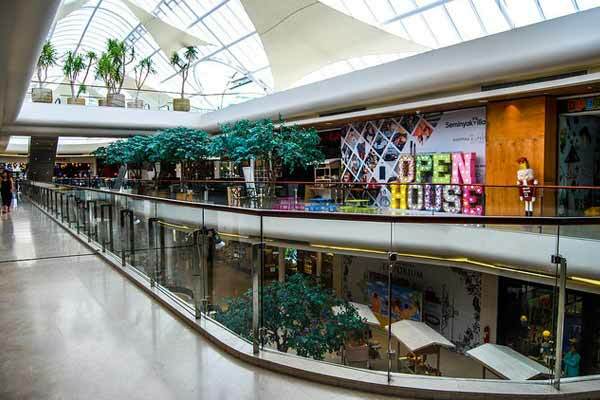 Or maybe you’d prefer somewhere in-between where it’s quiet, but you still have some amenities in the way of shops and restaurants? Bali can cater for all these situations if you know where to look. Seminyak Village Shopping Mall, Seminyak, Bali. The busiest tourist resorts of Kuta and Seminyak are where it’s all happening and if you want to go night-clubbing and have the most extensive choice of shops and restaurants that’s where you’ll want to be. These villages do still manage to retain their Balinese character too. For a rather toned-down version without the night-clubs but with plenty going on, lots of great restaurants and enough live music to have a bit of fun after dinner, Sanur is my favourite place to be. If you want to go even quieter while still being on the coast, but with easier access to lush green rice paddies and fabulous scenery, you might want to go a little further afield and consider Canggu, Candidasa, Amed or Lovina. Inland, you have the choice of the artistic hub of Ubud, which is quite a busy town, but with a very different vibe from Kuta. The boom of the night-clubs is replaced here by the meditative tinkle of gamelans and new age music. Or you can go right off the beaten track to really small villages where there are only locals and few amenities apart from local markets and roadside stalls and warungs. 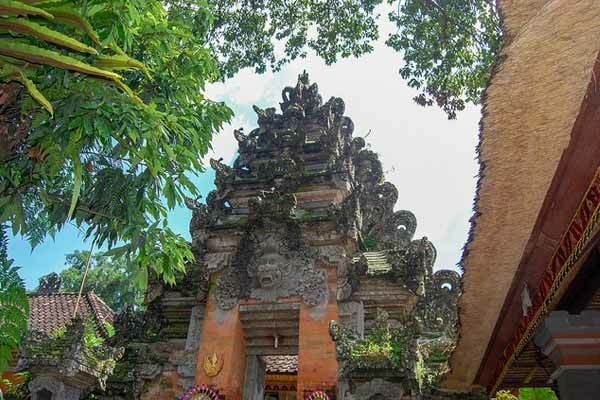 There are also plenty of mid-size towns which have very few tourists or western restaurants or shops, but which are very pleasant and scenic, such as Singaradja, Gianyar, Amplapura or Negara. 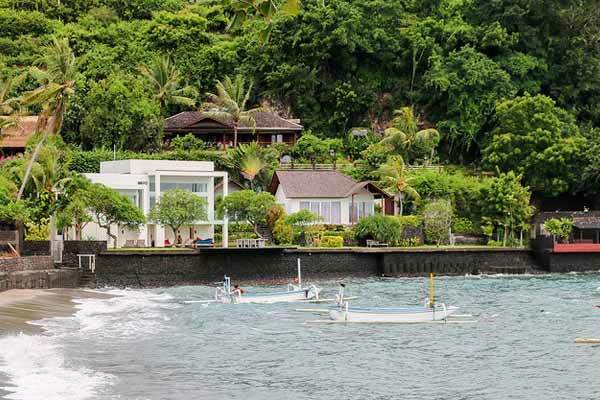 These could be ideal if you want to live away from other expats and tourists and totally amongst the Balinese. Although it can be very hot all over Bali, there are some areas inland as the altitude gets higher that can be cooler. If you’re not right on the coast where you can catch some sea breezes, the heat and humidity can be stifling sometimes especially in the monsoon season. To get some relief, Ubud can be a bit cooler, especially in the evening. The coolest parts of Bali are at the highest altitudes, of course. The area around the three Lakes (Bratan, Tamblingan and Buyan) is beautifully cool in the evenings and pleasant during the day. Pura Ulun Danu Bratan Temple, Bratan Lake, Bali. I had to buy a cardigan in the local market when we stayed next to Lake Bratan one September, and we actually encountered cool fog driving down from the highlands of Kintamani once. 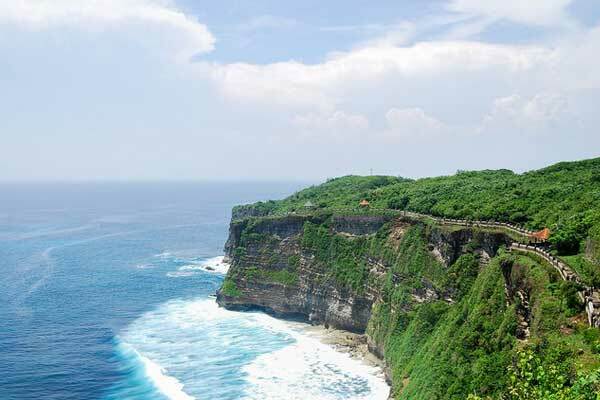 It’s a really pretty region and attracts visitors from all over Indonesia. 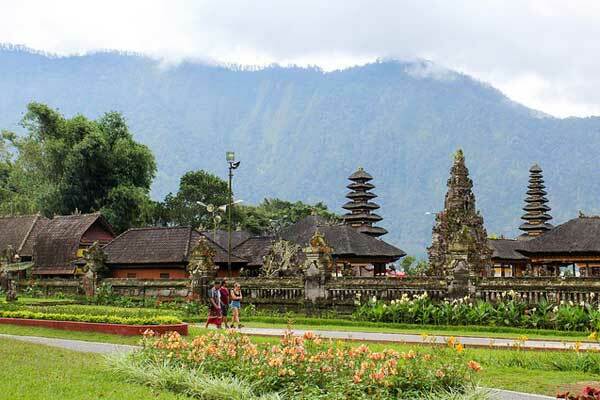 You can find some lovely restaurants and places to visit in the area, such as the Bedugul Botanical Gardens, but you won’t find supermarkets or shops. It might be a good idea to consider your distance from the airport if you want to make regular trips home or want to travel and explore further afield. 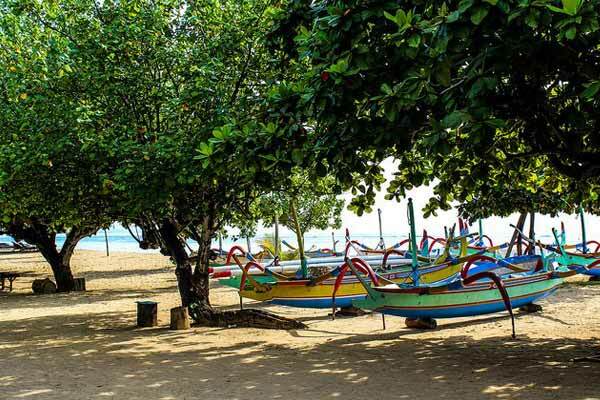 Some of the quieter places to live in Bali, such as Amed or Lovina, can be quite a trek from the airport taking up to three to four hours by car. 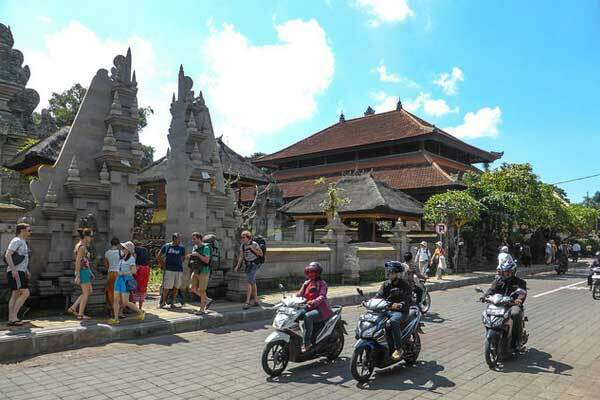 The easiest places for airport access would be the Bukit Peninsula, Kuta, Seminyak or Sanur. There is talk that work on the new airport for the north of Bali is starting soon, so Lovina and other places on the north coast may become more accessible (and busier) in years to come. It’s fairly obvious that if you’re a beach bum you’ll want to be by the coast. The best white sand beaches are in the west. You’ll find black sand beaches to the east and north of Bali and Sanur beach is protected by a reef which makes it very calm, but the beach is fairly narrow there. If you love surfing, you’ll also want to be on the west side of the island where the biggest surf can be found. Kuta, Uluwatu, Canggu or further west towards Negara if you want peace and quiet are popular with surfers.Canggu, Bali. If you’re a diver, the places to be are either Amed on the east coast or the far north-west coast for access to Menjangan Island. If you’re more into the arts and culture, yoga or meditation then Ubud is going to be a draw. For beautiful scenery, rice paddies, views of mountains and volcanoes you’ll also want to be around the outskirts of Ubud or further afield in places like Candidasa and Amed in the east, the Lake district of the island or the area between there and Lovina. If you fancy life without a car, somewhere you can walk or cycle everywhere, Sanur would be a good place to consider. It’s all on the flat and you can travel the length of the town along the beach-side boardwalk, thus avoiding the traffic completely. Ubud is a bit more hilly but still possible to walk or cycle. It’s rather more pleasant walking the main streets of Ubud now they have restricted parking in town and have put on a park and ride service. Think about whether you will need a car at all if you live in the main resorts, as you’ll be able to get everything you need nearby and there are plenty of taxis and drivers when you do need one. It may be more economical just to rent a car or motorbike for odd occasions than to buy one. If you decide to live further afield, you will probably find you need a car to get around. 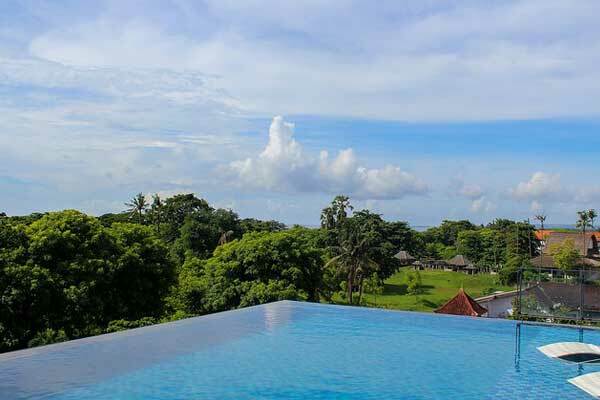 Inland, rentals can be a lot cheaper though close to central Ubud you’ll pay a premium. For a two-bedroom house with private pool and rice paddy views expect to pay around $1,500. If you go 20 minutes’ drive outside Ubud into the surrounding villages you can find villas with a pool for as little as $500 a month. If you don’t need a pool, or are happy to share one, costs go own even more. 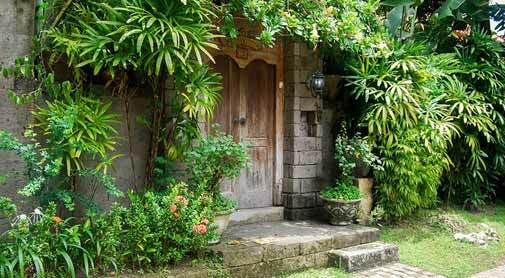 Living in a typical Balinese town or village instead of a resort could be very affordable. Even in Sanur you can get a bargain if you don’t need a pool or luxury. 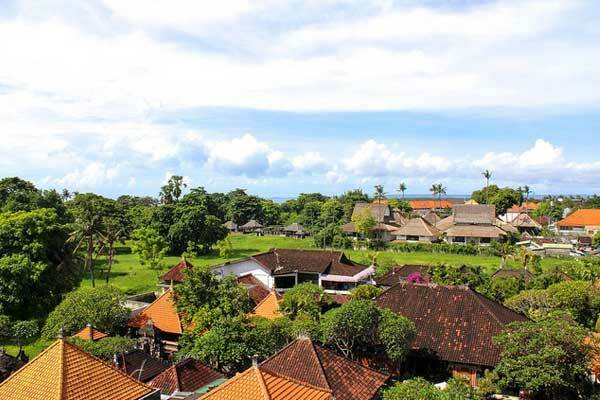 I have a single lady friend who was renting a small flat on the main street, above a Balinese family home with lovely views over the rooftops, less than five minutes stroll to the beach, for $300 a month. The same goes for eating out and buying food. You’ll pay a lot less away from the coastal strips, especially if you shop in the local markets and eat where the locals eat. Wherever you decide to settle, it’s always a good idea to try a short-term rental first to see if you like the area. Then you can always move and try something different if need be. Many landlords require a one-year lease, and it’s cheaper that way, but you can find shorter leases so you can test drive your new location before making a longer term commitment.